FUJILF stationary hydraulic scissor lift can be used to lift cargo with different levels, suitable for cargo moving between stairs, from basement to first floor, or to second floor. 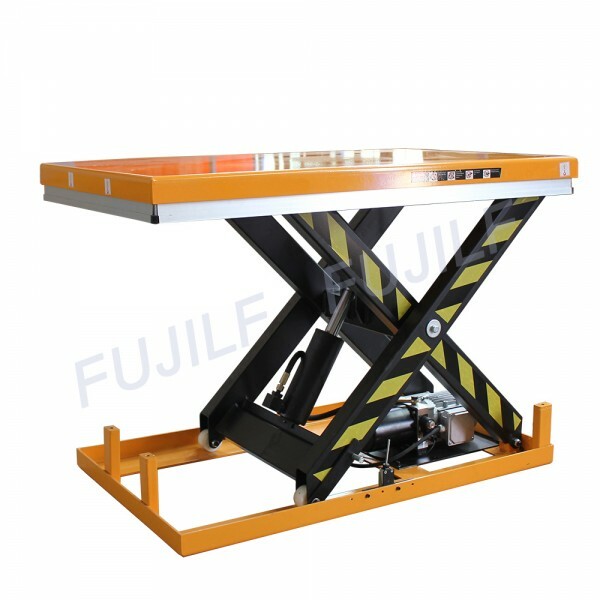 FUJILF hydraulic cargo platform lift Operation is easy. There are 2 sets control system installed on the stationary hydraulic scissor lift, 1 control box below, and 1 hand controller on safety guard rail that can be operated on work platform. 2) Support scissors: 200mm*100mm*10mm high strength Manganese Steel. 5) Piston Rod: 70*4 hard chromium plating surface. 6) High-pressure oil pump: from Italy or Chinese famous brand. 1.Low-tension (24V) control box with up-down buttons. 2. Upper platform lifted with aluminum safety bar preventing descent on contact with obstructions. 3. Safety clearance between scissors to prevent trapping during operation. 4. Heavy duty cylinders with drainage system and check valve to stop the lift table lowering in case of hose burst. 5. Internal power pack equipped with relief valve against overloading and compensated flow valve for controlled lowering speed. 6. Self lubricating bushings on pivot points. 1) We can design the customerized stationary hydraulic scissor lift as per your requirement. 2) The most suitable stationary hydraulic scissor lift will be recommended to you once we got your requirement.